By conforming to a business and human rights framework, both government and businesses stand to greatly benefit. A national action plan on business and human rights will be beneficial to India in the long term as it would complement the country’s ambitious development agenda and also reduce business-related risks and rights violations, an international expert has said. Anisha Rajapakse, a strategy adviser for social sustainability at Global Strategic Corporate Sustainability, which provides support to governments and businesses to embed social and environmental sustainability, said companies from around the world are increasingly investing in India and sourcing goods and services, but critical human rights issues remain unaddressed. By conforming to a business and human rights framework, both government and businesses stand to greatly benefit. For businesses, engaging in supply chain due diligence would strengthen their ability to mitigate reputational, operational and legal risks that impact on wealth generation and job creation. For the government, this would be pivotal in accelerating growth in trade and investment to India, she told IANS in an online interview from London. Her assertions came in the run-up to the UN Forum on Business and Human Rights taking place in Geneva on November 26-28. The central theme this year is “Business Respect for Human Rights: Building on What Works”. For Rajapakse, an international development expert with over 15 years of global expertise, establishing a specific business and human rights framework within India will be an ideal way forward as the guidance on human rights due diligence and support tailored to national business audiences, including small and medium-sized enterprises, is currently inadequate. A national framework will also facilitate policy coherence in government practice. The government must provide the much-needed leadership in this regard, she said. “India has ratified several international human rights instruments that impose explicit or implicit onus on the government to make sure that business enterprises operating within the country or its jurisdiction do not violate human rights. “In recent times, the government has also adopted several CSR (corporate social responsibility) initiatives — all aimed at encouraging the private sector to integrate human rights into their business strategies,” Rajapakse said. She said all such initiatives “are well-intentioned, but are often ad-hoc and piecemeal in their scope and reach”. “It’s also important to keep in mind that there must be checks and balances in place not only for companies operating within India, but also for Indian companies operating outside of India through subsidiaries or joint ventures,” she pointed out. This is doubly important in instances where the company does not have complete control of a situation and additional monitoring measures need to be in place. It cannot be “business as usual”. Companies sourcing from India and other countries are increasingly stringent regarding transparency of their supply chains and need tangible guarantees that they are free of unacceptable labour practices such as child labour, forced labour, sexual abuse and harassment of women. The latest report by the International Labour Organisation says close to 81 per cent of all employed people in India make a living by working in the informal sector, and are consequently the most at risk for rights abuses. Rajapakse said the corporate responsibility to respect human rights cannot be ignored even despite the slow pace or inaction of governments to deliver on this duty. Over the last 25 years or so, India’s economic expansion has catapulted it into the ranks of being one of the world’s emerging major powers, and it continues to actively look for ways to ramp up its economy to sustain this momentum. With an estimated population of around 1.3 billion and giant global brands such as Amazon, Unilever and Apple, as also leading fashion brands, continuing their investment in India, the private sector will be a critical partner to steer these goals, Rajapakse said. However, getting companies to understand their full responsibility to protect and respect human rights remains a challenge. 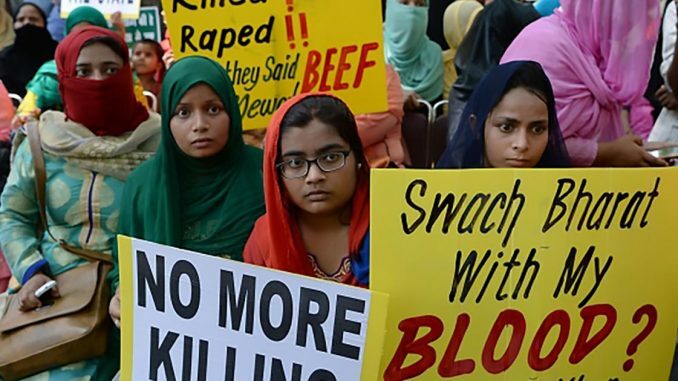 “Despite the good intentions, currently there isn’t enough buy-in to the uptake of the United Nations Guiding Principles on Business and Human Rights (UNGPs) in India. Even today, Indian companies, for the most part, are operating under the CSR mindset with emphasis on corporate-charity partnerships which has little bearing on companies changing their business practices. “What is really needed are renewed discourses about formalising a set of national voluntary guidelines, leading to the development of a National Action Plan for India on Business and Human Rights with adherence to the UNGPs that will enable both the government and businesses to make clear what a responsible business should look like,” Rajapakse said. India’s Ministry of Corporate Affairs is leading the process of updating and finalising its national guidelines on social, environmental and economic responsibilities of business. These are expected to be finalised and published by the end of this year. “Changes will not happen overnight, but they can lead to lasting impact over time. There is no magic bullet solution, but every little effort helps and enables everyone to have their rights protected at work… That way, business can indeed be a force for good,” an optimistic Rajapakse added.